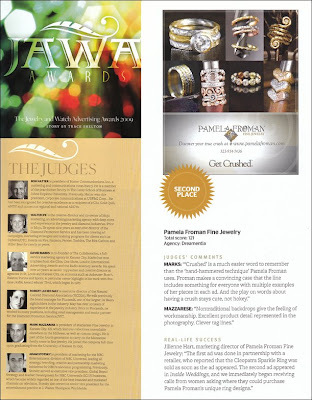 Pamela Froman wins JAWA Award for "Get Crushed" Campaign! 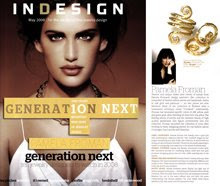 InDesign Magazine recently published the results of their second annual Jewelry & Watch Advertising Awards competition (also affectionately known as "the JAWAs") and we were excited to see Pamela Froman's "Get Crushed" campaign took 2nd place in the Manufacturer/Designer Procuct-Only Magazine Ad category! 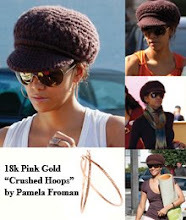 "'Crushed' is a much easier word to remember than the 'hand-hammered technique' Pamela Froman uses. Froman makes a convincing case that the line includes something for everyone with multiple examples of her pieces in each ad. And the play on words about having a crush stays cute, not hokey." "Nontraditional backdrops give the feeling of workmanship. Excellent product detail represented in the photography. Clever tag lines." "The first ad was done in partnership with a retailer, who reported that the Cleopatra Sparkle Ring was sold as soon as the ad appeared. 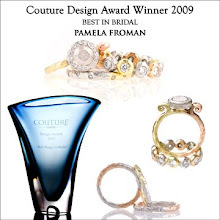 The second ad appeared in Inside Weddings, and we immediately began receiving calls from women asking where they could purchase Pamela Froman's unique ring designs." We love the campaign, and we're so happy to know that the industry pros who judged this competition love it to! We would like to thank all the judges of the JAWAs and, of course, big Thank Yous go out to our photographer, Jay Lawrence Goldman, and our ad agency, Dreamentia! "Nearly 160 companies submitted more than 350 ads for consideration by our exceptional panel of judges, which includes the president of marketing for NBC Entertainment, three award-winning owners/directors of national marketing firms, an industry association director, and the president of a prestigious retail operation. Judges were split into two groups of three, and none were allowed to vote on an ad in which they had a vested interest. They were asked to score each ad on five different criteria dealing with quality of production/graphics/photography, creativity, innovation, and emotional impact. Each criterion was graded on a scale of 1 to 10, which meant a minimum score of 5 and maximum of 50 for each ad, per judge. For any given criterion, a "1" meant the judge felt the ad was average in that quality, while a "10" indicated that the ad was extraordinary and beyond all expectations. A perfect score for an ad would have been 150. You can view all of the wining ads, with full audio/video for the TV and radio winners, at www.instoremag.com." 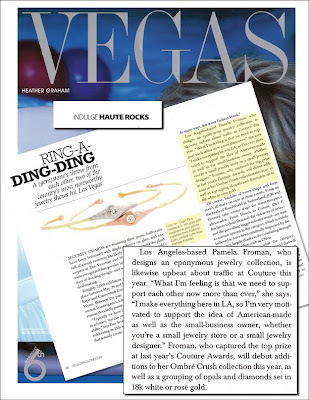 Los Angeles-based Pamela Froman, who designs an eponymous jewelry collection, is likewise upbeat about traffic at Couture this year. "What I'm feeling is that we need to support each other now more than ever," she says. "I make everything here in LA, so I'm very motivated to support the idea of American-made as well as the small-business owner, whether you're a small jewelry store or a small jewelry designer." 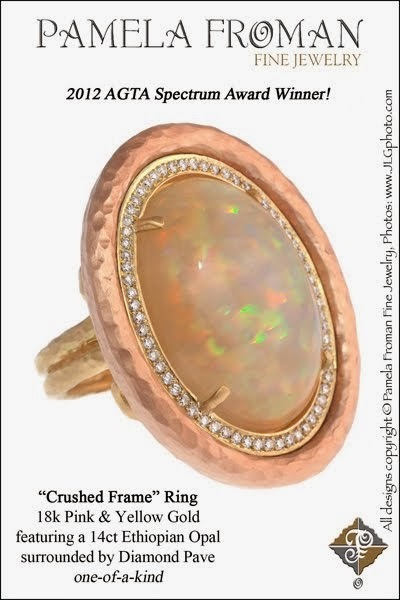 Froman, who captured the top prize at last year's Couture Awards, will debut an additions to her Ombre´ Crush collection this year, as well as a grouping of opals and diamonds set in 18k white, [yellow,] or rose gold. 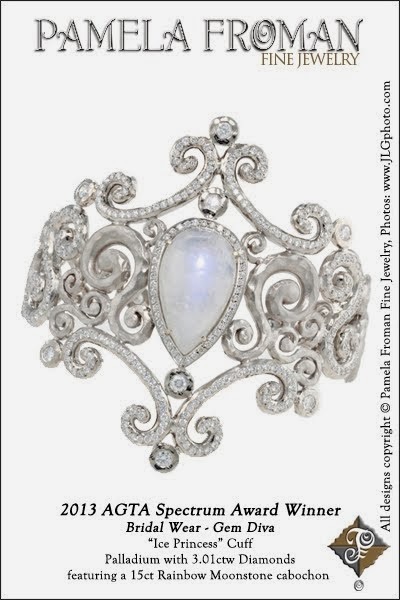 Ultimately, no matter what the category, Froman believes there will be one trend that will emerge overall at JCK and Couture this year. "Anytime you're challenged by the economy, that's when people are going to be out there looking for something different," she says. "The way to set yourself apart is with the unique and special, pieces with stories. That's the way to come out on the winning side." "Individuality is the underlying theme of beauty," muses Pamela Froman when summing up her philosophy about creating jewelry. To achieve this individuality, the award-winning designer's collection is handcrafted in Los Angeles, thus ensuring that no two pieces are identical, even if similar in design. Marie Helene Morrow of Reinhold Jewelers in Puerto Rico, who carries Pamela's line, says, "Pamela doesn't overlap with any other designers. Her hand-hammered technique [which Pamela calls "Crushed"] is completely different and unique to her. 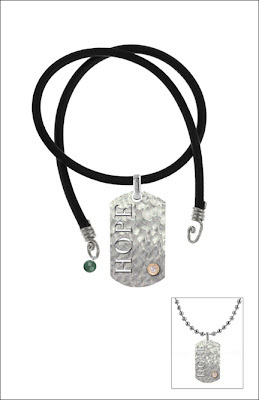 The pieces are extremely versatile and can be worn every day and for any occasion." 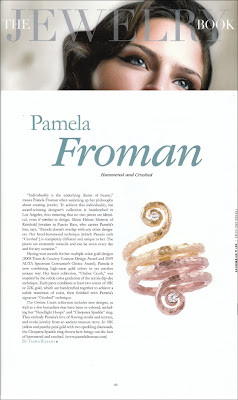 Having won awards for her multiple-color gold designs (2008 Town & Country Couture Design Award and 2009 AGTA Spectrum Consumer's Choice Award), Pamela is now combining high-carat gold colors in yet another unique way. Her latest collection, "Ombre Crush," was inspired by the subtle color gradation of the textile dip-dye technique. 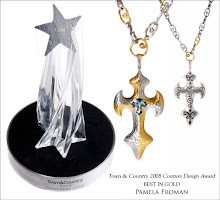 Each piece combines at least two colors of 18k or 22k gold, which are handcrafted together to achieve a subtle transition of color, then finished with Pamela's signature "Crushed" technique. 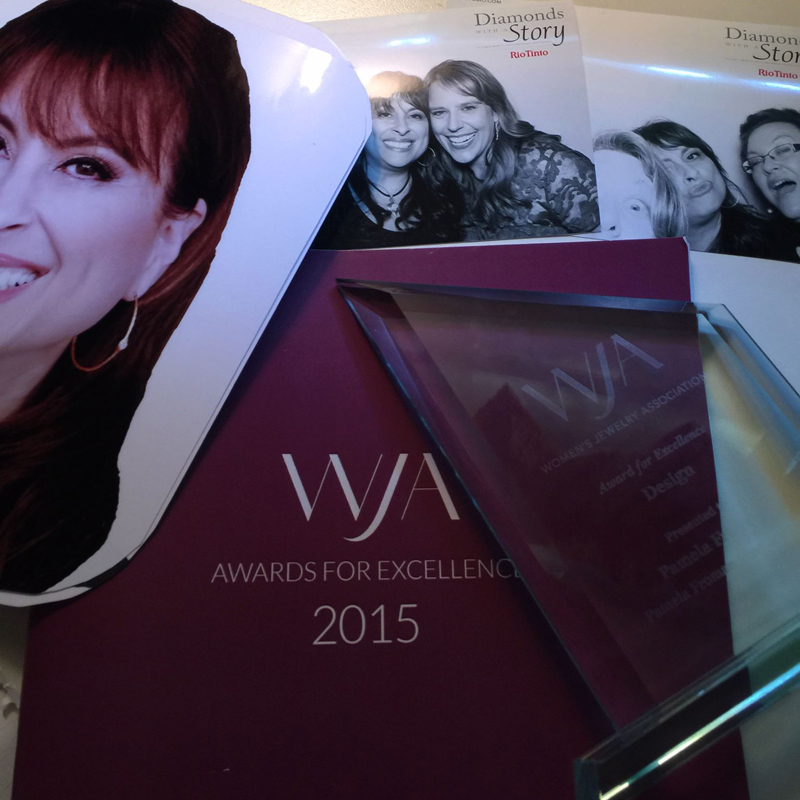 Pamela Froman has been nominated for a WJA Award for Excellence! 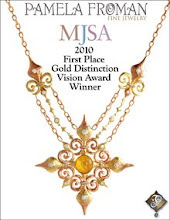 We recently learned that Pamela Froman has been nominated for a WJA Award for Excellence in Fine Jewelry Design! 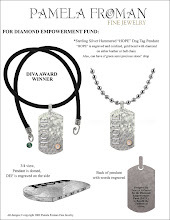 The two other Nominees in this category are Katey Brunini of K. Brunini Jewelry, and Ann Lagos of Steven Lagos, and the list of past winners include amazing women such as Erica Courtney and Paula Crevoshay. Pamela is thrilled and honored to be nominated for such an impressive award so early in her career! Winners will be announced during the fabulous Awards for Excellence Dinner July 27th in New York. 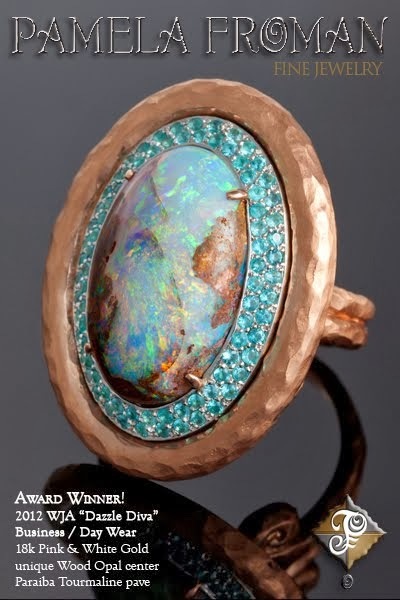 The Women's Jewelry Association pauses each year to honor a number of outstanding women who have excelled at their jobs in the jewelry and watch industry -- and by doing so have advanced the cause of women in general. A magnificent banquet attended by more than 600 people is the venue for these awards, making it a memorable evening for everyone.